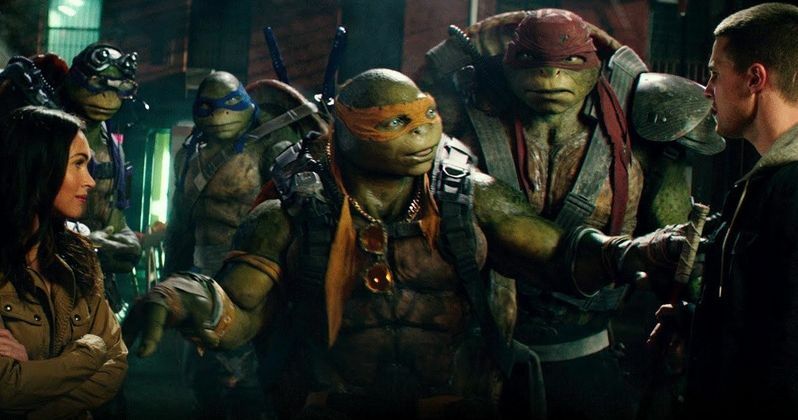 Michelangelo, Donatello, Leonardo, and Raphael return to theaters this summer to battle bigger, badder villains, alongside April O'Neil (Megan Fox), Vern Fenwick (Will Arnett), and a newcomer: the hockey-masked vigilante Casey Jones (Stephen Amell). Paramount Pictures has released an all-new action-packed trailer for Teenage Mutant Ninja Turtles: Out of the Shadows. We also have a new one-sheet poster that teams all four sewer dwelling brothers as they set off to embark on an all-new adventure. After super villain Shredder escapes custody, he joins forces with mad scientist Baxter Stockman (Tyler Perry) and two dimwitted henchmen, Bebop (Gary Anthony Williams) and Rocksteady (WWE Superstar Stephen "Sheamus" Farrelly), to unleash a diabolical plan to take over the world. As the Turtles prepare to take on Shredder and his new crew, they find themselves facing an even greater evil with similar intentions: the notorious Krang. This latest sneak peek introduces the idea of purple ooze, and tease that the Turtles might be turning human. But they won't stay that way for long! Alan Ritchson (Raphael), Noel Fisher (Michelangelo), Pete Ploszek (Leonardo) and Jeremy Howard (Donatello) all return to reprise their roles as the Turtles. Dave Green directs from a script by André Nemec and Josh Appelbaum. The screenwriters also wrote last year's Teenage Mutant Ninja Turtles, which took in $485 million worldwide from a $125 million budget. This latest footage indicates that this sequel will actually be a callback to the original 1991 live-action sequel Teenage Mutant Ninja Turtles II: The Secret of the Ooze. During the Teenage Mutant Ninja Turtles: Out of the Shadows WonderCon panel last month, producers Bradley Fuller and Andrew Form revealed that the evil Krang will be voiced by none other than Fred Armisen. Bradley Fuller teased that "Anyone who loves Fred will love what he is doing." While Andrew Form hinted that we may see more of Krang in marketing materials soon. That doesn't prove to be true, as the space creature is not revealed in this latest trailer. While Fred Armisen is best known for creating and starring in Portlandia, and for leading the 8G Band on Late Night with Seth Meyers, Fred Armisen has a number of voice roles to his credit. The actor has voiced roles in Aqua Teen Hunger Force, Squidbillies, Archer, The Looney Tunes Show and The Smurfs movies. We'll have to wait and see when Fred Armisen's voice is revealed as Krang. In the meantime, enjoy this action-packed new sneak peek at what is sure to be one of this summer's biggest hits.